CopGod is the best Supreme bot ever. It supports all countries and guarantees higher chances of getting your wanted Supreme items. Follow CopGod twitter for the latests news and updates and read real feedback. 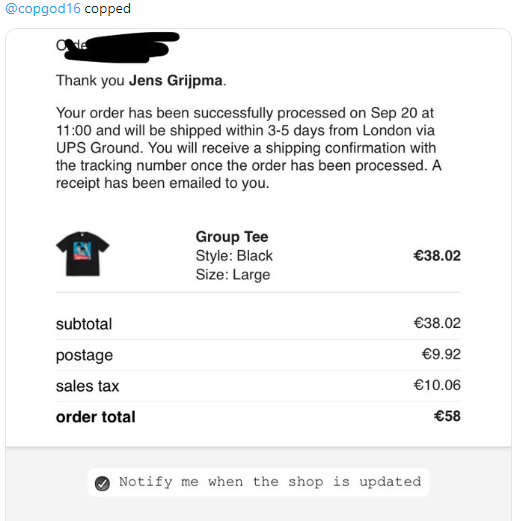 CopGod is the best Supreme bot on the market at the moment. It offers Supreme, SNKRS and Shopify bots for : IPhone, Windows and Mac and the special exclusive software for successful copping. So the last one provides captcha bypass, user-friendly interface, free updates and more. CopGod supports all countries and guarantees higher chances of getting your desired Supreme items worldwide. CopGod restock normally twice a month with an average of 25-50 a restock. The retail price of the bot is $100 which for all of its features is a really good price, imho. For example its competitors can cost 180$ in total because of renewals, but renewal for CopGod is $100 for each season so in sum it is $200 a year. The resell price is $125-150 so I would say it's profitable. Also if you have any problems, feel free to contact the team or watch free tutorials. This is the only bot that cares about users’ success, so you do not need to worry about anything, CopGod makes all the job done so you can enjoy the final result. It is loved and hated by the community, but it has a lot features and advantages so you can just try for 1 season. The mobile version is simple and user-friendly. There are a lot of options and embedded discord server. Follow CopGod twitter for the latests news and updates. Don’t miss a chance to share your success too, start copping with CopGod.